Hope you all had a rocking Thanksgiving! I had my fill of classic holiday dishes and treats, so I'm all good. Ended Thanksgiving night with late night movies on cable (Nowhere Boy and Serendipity . . . gosh, John Cusack, is so dreamy). It was a perfect night. I won't be heading to the mall today for Black Friday because of work, but my sister is coming into town later today and I can't wait to chill with her and hear about her trip to Israel. Here are some pictures taken a few weekends ago, smack dab in the middle of fall. I was inspired by the colors of autumn this day, as you can tell. Liquid golds, warm browns, hints of yellow and orange. It is all so dreamy to me. Throwing a little leopard in for good measure is just me being me. You know I can't help busting out a little animal print every now and then. Say hey to Kim. Kim is such an awesome girl and one of my very first Philly friends. We are both so busy that we don't really get to see each other that often even though we both live so close to each other. But when we do get together, it is an event for sure. perfect combinations perfect photos! love it! Love your shorts and bag!!! Love this look so much! Wow,I really like your knit,it's soo cute! You girls look so beautiful! Very autumn perfect. So head over heels for your Doc Marten loafers and that feline print bag. So first off love everything about your outfit. Also, John Cusack? Yes. Great outfit! :) x S.
I'm always a sucker for shorts and tights! I love how you wore this look, that sweater is adorable and i love your scarf! Pretty sweater and I love your bag ! love your look, so simple!! Those shoes are so awesome! Wannahaves! This outfit is so lovely! I love your sweater! Nice post, I like it so much! And I like your sense of style!! Fox House giveaway on my blog! Take a look and if you like follow me, I’ll be waiting for you: Cosa mi metto??? Stunning, as always! I like your shoes especially and your sweater! Gosh, I love leopard print on you, its just what any fall wardrobe needs and those dr. martens are gorgeous in the lovely red. I would love it if you checked out my blog, I have interesting fashion posts you might love to read. Warmth was the perfect title! You look great, especially in those oxfords. I've just discovered your friend's blog a few days ago. I think it's great.Doesn't at all surprise me that you two are friends. Happy Holidays! Lovin your outfit!! The warm colors are fantastic and great sweater:) I love Kim's look too! Super cute! Preppy and chic. I absolutely love your bag and shoes! Love both looks, and the Autumn colors. Serendipity is a magical film! super cute, love that scarf! this is probably one of my favorite looks! Such a cute outfit! You both look lovely! Great outfit, everything matches so perfectly with eachother! love the get up! you and your friend are adorable together!! im in love w those shorts! I love this! Definitely perfect for the Fall/almost Winter! being inspired by the colours of your surroundings is a great way to create an outfit! You are absolutely stunning! This outfit is seriousy gorgeous. I love the warm colors paired with the black, it's such a great combination. Your chunky sweater is PERFECT. And your little leopard bag is darling! I absolutely adore the cutoffs with tights as well. And I love the shoes, they're so delightfully masculine. I love your bag and I love this blog. Wow I can't believe you have that many followers how did you do it. I have 130 followers and it has been a struggle for me to get there and a struggle to grow it. Can u help me? I am so jealous about the weather you have there! And the boots are great! i love all the warmth from these colors. its like holding on to the last few weeks of fall! this scarf is so multifunctional, and it looks great with everything! Great outfit!! You both look gorgeous! thats my favorite thing...tights and shorts! so cute i love your clutch too! such a cozy but chic fall outfit! you girls both look so cute in these photos! glad you had a great Thanksgiving! you look so amazing! and we are so much loving your knit! I totally love your outfit. You're right, it wouldn't be very you if there isn't a little animal print somewhere! Those Dr. Martens are looking snazzy! your outfit is reaaal cute! perfect for the fall weather. the colors too, very beautiful. those leaves look so pretty!!! and i love how you paired the black shorts with black denim! cute! Such great pictures! You look lovely. you look so cute and comfy! That cream sweater is fantastic. I love the bulkiness of it, it looks so warm. I also really love your friend's sweater I love the stripes and slouchyness of it.. You girls look so cute! 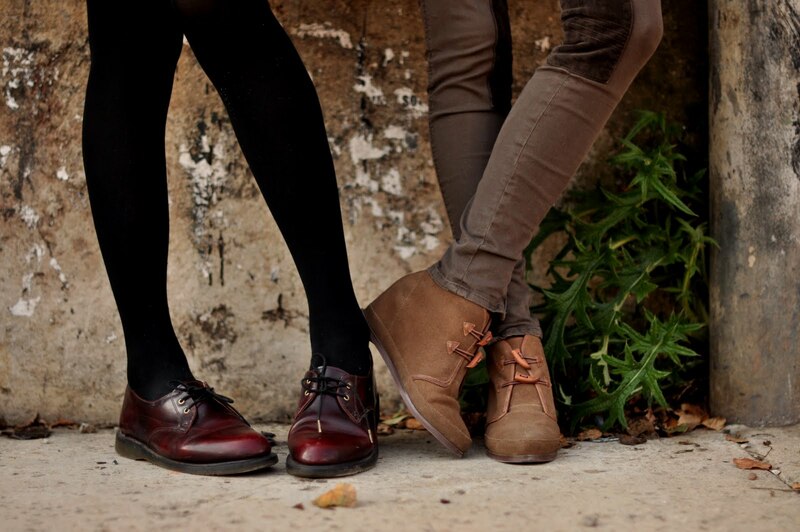 loving the textures and cherry red brogue style Dr. Martens! A great casual ensemble! i love this whole outfit Dy! so comfortable and you look adorable! I really love the shades of brown in your outfit. The scarf pattern is beautiful! oh the fall colors are so perfect! they look beautiful in a photograph as well. fabulous - i always come here for inspiration! These photos are so beautiful of you both! Loving the colors and layering going on in both of your outfits...you seriously look extra gorgeous in these posts if that's possible, maybe it is because you look so darn happy! Love the little leaf photo - you are too cute, Dylana! so so cozy. hope your move went well! Like the length of the shorts a lot, and love the fact you can look gorgeous in flat footwear, so jealous! So..um why are you not a model? You look so very beautiful Dylana! I always like to see your pairings. and i love your blog! love these shoes. really great outfit. glad you had a great thanksgiving! i definitely watched Serendipity at least twice over that weekend..it was all over tv!